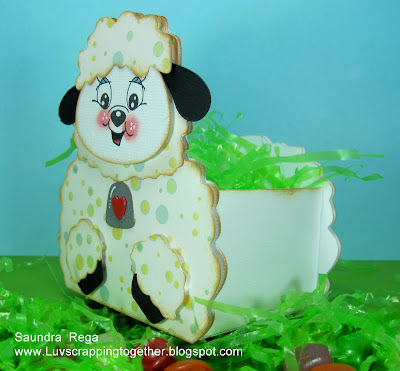 Liz's Paper Loft: My Guest Designer: Saundra! Hi Everyone! Saundra here from Luv Scrapping Together! I am so thrilled be a guest designer for Liz as she is recovering from surgery. With Easter a few days away, I wanted to make some cute little treat containers for my girls. I found the cutest SVG file from My Scrap Chick and just had to use it. 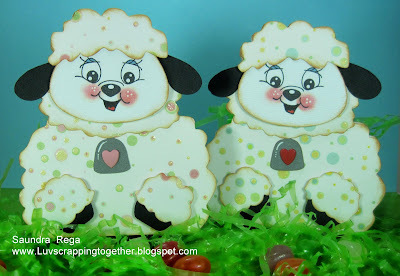 I used the file Trio of Lambs and stamped the face with Peachy Keen Stamps Wide Eyed and Bushy Tailed Assortment. The designer paper is some that I have had for quite some time. I inked all the edges with Ranger Distress ink in Tea Dye. I used fun foam to pop all my layers. Here is a rear view. These layers were also popped with fun foam. I would love for you to visit me at Luv Scrapping Together! I wish you all a very blessed Easter holiday! Oh my goodness Saundra, these are just wonderful, your girls are going to love them! Thank you so much for filling in for me! I hope all of you have been enjoying all My Guest Designers! I have to say not crafting has been much harded that I could've ever imagined!!! I'm hoping to be back soon and when I do, I will have some exciting news to share with you, but not quite yet. However, in the meantime, while I'm recovering, I'm reading every comment! Not only reading them, I'm, counting them. Because at the end of all this, I will have two announcements! The first will be a winner of some exciting BLOG CANDY! The second, it's a big one...and no, I'm not coming out with stamps...you just have to wait and see! Oh this just made me smile!! Those litte lambs are just so very adorable!! O wow these are super cute!! I love the inking and the cute little faces!! Fell better Liz!! These are so so so adorable!!! Love all the dimensions on those adorable lambs! Hope all is well Liz~ Awesome job Saundra and Happy Easter! These are so cute, great job and enjoy your holidays! This is just WAY to cute!! I love the papers and the sweet adorable little faces:) Awessome job Saundra! Liz, hope your doing well. Wishing you and your family a Happy Easter!! Oh how DARLING Saundra!!! These are so cute - I just want to pick them up and snuggle them!!! OMG Saundra! Your little lamb treat containers are sooo ADORABLE....your daughters will love them! Thanks for sharing :) .... Have a Wonderful Easter! Your lambs are adorable!! I like the layers. Hee hee...this project just makes me giggle! 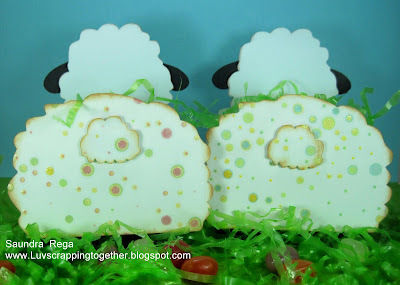 Those sweet little lambs are adorable...and the back view is even more fun!! Saundra- these are wooly fuzzy adorable. Thanks for sharing and filling is for Liz. Liz-one more day closer to that speedy recovery I'm sending your way. 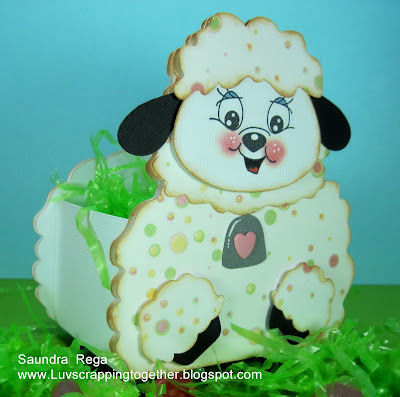 Saundra, these are too CUTE and FUN!!!! Such an adorable project, love the cute little face! Sandra ~ aren't these just the CUTEST little lambs EVER! I LOVE them! CUTE!!! 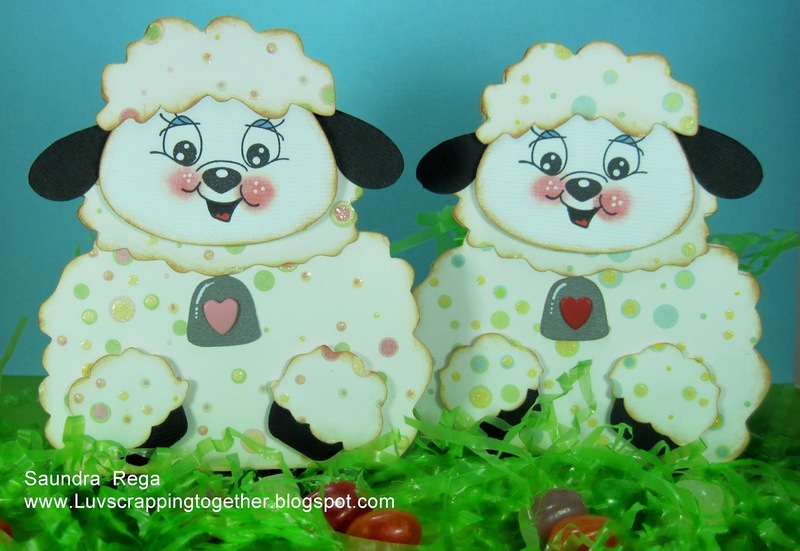 Oh these turned out just too cute... Love them..
Great job on the lambs...the paper is perfect for them and the Peachy faces are too sweet! They even look great from the back. Love it! This is just the cutest little boxes!